One week ago I began three small steps toward rebuilding good habits into my day. The last seven days have had ups and downs, which you can read about in the posts over that time period. Overall, there has been success though. Before I share what I’m adding when week two begins in the morning, I thought I would divulge a few tips that helped during week one. Make our smoothies the night before. Smoothies take longer than dumping 100% whole grain cereal and almond milk into a bowl. So, by making them ahead of time, I shave at least five minutes per smoothie off my morning routine. I can use those five minutes to do something more to my hair than a hat/ponytail… or I can pray… or I can rinse my face and apply some mascara… or I can make my bed… or I can floss… um, yes, most mornings I do the bare minimum to get my rear out the door and to the rink on time (sometimes I even go in flannel PJs). Set out what I need for the morning routine. This means packing my backpack to take to the rink, writing any checks (do mothers of skaters do anything else? ), setting out clothes (so I don’t go in PJs), gathering fruit for snacks, making sure the younger kids have their things ready… find my keys (normally not an issue but on a couple of occasions my purse was in the vehicle that the Husband left with before I got out the door… which meant I did not get out the door and had to cancel those lessons). It only takes a few minutes (less than 15) to do this. By doing so, I free up 10-15 more minutes in the morning. Gasp! I might actually have time to read a devotional… or look better than half-way presentable… or do my daily “de-clutter” routine to save time later… or do some pilates… or drink my smoothie before leaving the house, instead of on the drive to the rink… Wow, my days are already starting better! Put something away when I enter/leave a room. Since I’ve spent the fifteen minute focus on my office all week, the rest of my home could be neglected. So, I started looking for ways to de-clutter other parts of the house more gradually. When I enter a room, I look for something that could be put away in that room. When I leave the room, I look for something that can be taken to another room (I try to pick something that goes in the room I’m going to next). I am amazed at the difference this simple practice made in a matter of days. Teach the kids not to set ANYTHING on my desk (unless I specifically tell them to). After finally getting my desk cleared off enough to actually use, I came back into the office later that day to discover that my almost ten year old had set the big tub of crayons on top of my closed laptop. I called them all into the office (feeling much like a non-foul-mouthed version of Gordon Ramsey), “Every one of you, get in here now! Who put this here?” The precious culprit raises her hand with a smirk. “Is that where it belongs?” They all shake their heads. “Do not set anything on my desk anymore. This area is my workspace and I need it clear. Understand?” They all nod. Then the darling almost ten year old raises her hand and asks, “What if you tell us to set something on your desk?” I stare at her for a moment, “Seriously?” She giggles. Clearly I didn’t use enough throwing of items, volume, and foul language to make them run off shouting, “Yes, Mother!” Monday, when I fined them all for telling me they were finished folding/putting away their laundry when they weren’t, I told them to leave the money on my desk. As you guessed, that same child says, “On your desk? Are you sure?” Sigh. Put things away when you’re finished with them. Yes, this is what our mothers preached when we were kids. Too bad I didn’t make it a habit then. I’m working on it now though and preaching teaching my kids to do the same. Set limits during your fifteen minute slots. When de-cluttering for fifteen minutes, I didn’t want to spend the entire time working on one task (like scanning in all of the Daughter’s competition score sheets). So, I put all of her score sheets in a manilla folder, and scheduled a time on my ongoing task list to work on it. Anything I came across, that would take more than a couple of minutes to deal with, I scheduled for another time. I found photos from the almost ten year old’s last play performance in my office. Those photos were for display on the cork-boards in her room*. So, I scheduled to help her re-organize her boards today to include the new photos. It took us about twenty minutes, but now it’s finished, the photos are no longer laying about my office, and she even has extra space to add other things. Add sliced fruit to the water. I like water, but sometimes I want something else. Drinking juices means added calories and sugar without the fiber from the fruit. So, I started slicing up oranges, lemons, and limes to put in my two liter water pitcher. I keep it nice and cold, which makes for a refreshing, hydrating treat during these record breaking temperature days. Most days I drank more than the 2 liters, and I think that had a lot to do with the added flavor. Now, without further ado, let’s move on to how I’m going to continue taking back my time, home, and health… one habit at a time. Time: Get up at 4:30 every morning on weekdays & 5:30 on weekends. Because I did not do this every morning last week, I’m going to continue working on it… with a couple of alterations. I do not need to be up at 4:30 on weekends (or holidays, or non-rink days). So, I started thinking about a time that would be better suited for those mornings, but wouldn’t throw me off too bad when I go back to 4:30 the next day. I think 5:30 would work. I’ll try it this week and see. Again, the point is to rise early. I still won’t set any rules on how to spend that time this week. Home: Spend 15 minutes per day de-cluttering – Week two will continue focus on visible surfaces only (no insides of drawers/closets/cabinets/boxes). I am still sorting through my office, but should I finish in there this week, I’ll begin working on the formal living room. That room has “organized” clutter in it, and is the first room seen when you walk into my house. Health: Continue to Drink 2 liters of water per day and add 8 ounces of greens – On mornings that I have my green smoothie, I get about 4 ounces of greens already. Greens are so good for us! Well, that’s my plan for week two. I am asking for the Lord’s help in accomplishing this, and His blessing on what does get accomplished. It feels somewhat odd doing any future planning after my post earlier today. However, I think the point isn’t to avoid making plans, it’s to hold your own plans loosely, allowing room for God to change them as He sees fit. 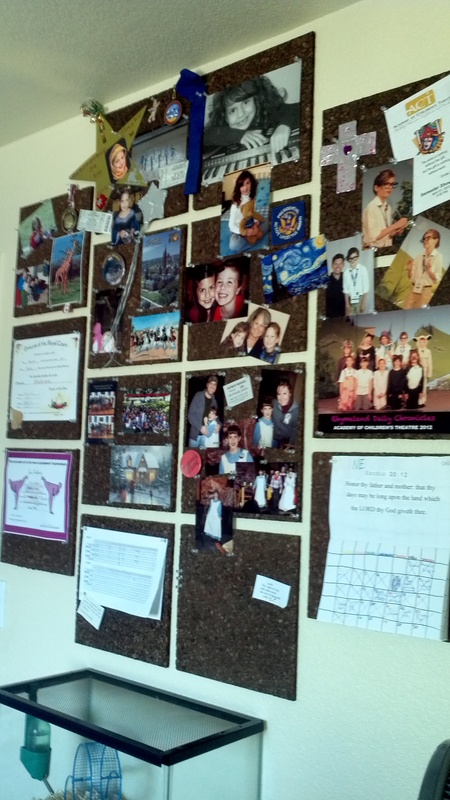 * The photo is of the cork-board display in one of my kids’ rooms. We found these cork-tiles at Hobby Lobby several years ago. We put them in all four kids’ bedrooms and in my office. This allows them space to display photos, art, and memorabilia that can be changed out whenever they get tired of it. This also keeps them from taping/sticky-tacking things all over their walls. It’s a win-win. This entry was posted in Brick Removed, Freedom, Tools by Jules Lane. Bookmark the permalink.